Dear readers, due to personal circumstances this weeks blog might be short, it might not so I’ll see where it takes me. This week I wasn’t met by any so called official telling me to move on, I was getting very annoyed about this because they were taking me away from helping people. I told them this and each one of them shrugged there shoulders and more or less said ‘well’. It wasn’t easy resolving this but many thanks to my MP Angela Rayner and the Labour Party for supporting me, all my blog readers and fellow activists. It was completely ridiculous that they wanted to move us. I am aware however that they’ll now be most likely looking for an excuse to move us. The security camera is constantly watching us whilst we are standing outside the Jobcentre. The Jobcentre however aren’t celebrating with us, they’ve now shut the blinds on all of the windows so that we can’t see in. Aren’t they a lovely bunch… Not. The weather was absolutely freezing, the wind was so cold and we ended up finishing earlier than normal. I apologise for this but it was really cold, much colder than usual. Come on spring I’m ready for some nicer weather now. Today’s food parcels went straight away as usual. Everyone that needed to be helped was helped, everyone needing signposting was signposted we never leave anyone we always help everyone that approaches us. We will hopefully be able to stay the whole two hours next week. Today’s mood outside the Jobcentre echoed the weather. No one that we spoke wanted to be there, all of them were frustrated with the Jobcentre and the DWP. 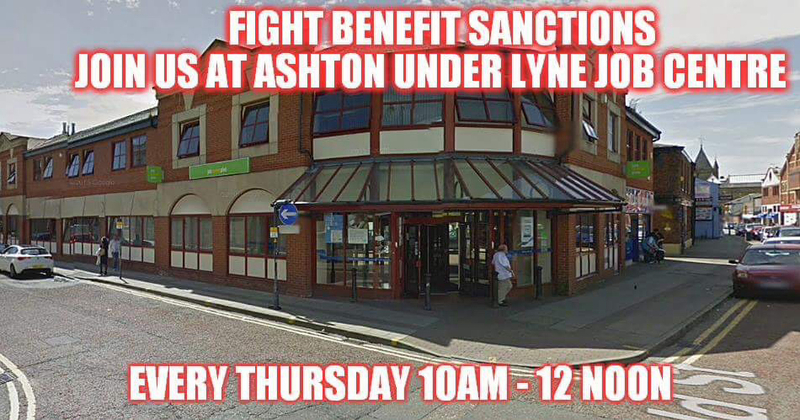 Universal credit has totally destroyed many of the people in my town Ashton Under Lyne. A combination of general austerity measures, massive reductions in the councils funding and universal credit has taken the soul out of the town. One day I’m certain that we will get it back. We spoke to an older gentleman, he had attempted to make the long walk up the stairs because he didn’t know that there was a lift inside the building situated in the library. There really needs to be more signs, or at least some signs putting up outside the building telling people where everything is. His story is this. He’s a disabled man and he doesn’t understand how this system works. No one has really taken the time to describe it to him and he’s feeling lost and frustrated. He told us that his ESA payments were being messed with. He wasn’t receiving his payments and he didn’t know why. He’d tried to phone the DWP up twice, had waited on the phone for two hours to speak to an advisor but was cut off both times after two hours. So an older, disabled man couldn’t get any answers. It’s ridiculous that the government will tell the public that they can always speak to an advisor, the truth is often very different. 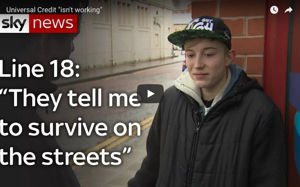 He ended up giving up and making the five mile journey to the Jobcentre to hopefully sort it out. This poor man was struggling, he shouldn’t have had to go through this but he’s forced to. Have I mentioned that I really hate the government and the DWP? We spoke to a woman who was completely baffled by the universal credit system. Because she works and had received two wages in one month she didn’t receive her universal credit payment. It’s not her fault that the universal credit system doesn’t recognise that sometimes people do get two wages because of month changes. I then saw a real fear in her eyes as she turned round, looked at me and said that because of this she might loose her house, become homeless and she didn’t know what to do. I gave her some advice and signposted her for help. The truth is that thousands of people are being evicted because they’ve not been able to pay their rent because of the universal credit system. It’s not their fault they’re dealing with a cruel and inhumane system, a system that was created not to care. It costs local governments far more to place families in emergency accommodation when they become homeless than it does to keep them in their homes. We really need to stop the hell thats universal credit and start to treat people with dignity and respect. We then spoke to a woman who was also claiming universal credit. Her problem is this. She was dismissed from her job as a dinner lady, she went on to claim universal credit but hadn’t realised that her old employer was still paying her. Yes I know that some will say that she should have known this but she really didn’t. Because of this she’s now got to pay back her wages and she can’t make a new claim for universal credit until next month. What a mess, of course the government will except her to live on nothing. She’s also a carer for a family member but was refused carers allowance because her income was too high. I advised her of what to do and signposted her to relevant organisations. We spoke to an older woman who was fed up of being sent on these ‘crap courses’ as she put it. She told us that these courses are absolute rubbish and haven’t helped her one bit. Remember the DWP and the course provider make a lot of money from sending people on these courses. Unemployed and disabled people are seen as a financial commodity not a person. We then spoke to a man that has been going through hell with the DWP. He’s an older man and also doesn’t understand the new DWP system. His story is this. He’s one of the thousands of people that have failed their PIP medical assessment. He used to claim DLA. He appealed this decision and failed. He took it to the tribunal level and he failed. As a result he’s now trying to make another claim but he is really confused, ‘It’s so confusing, I haven’t a clue what to do’ he said. He’s battling against a system that doesn’t care, that hates him and would prefer it if he disappeared somewhere. Many of us do care though, we are trying to change things and despite what some people will say, we are making a difference. Solidarity to all fellow campaigners and to everyone suffering under this inhumane system. This all happened in less than two hours. The DWP tried to get rid of us and for a while they really thought that they had won but they didn’t and we be back next week between 10-12 regardless of what the weathers like. I can’t thank Kev and Daira from DPAC for joining us today, we really needed your support thank you so, so much. Please read, share email and talk about my blog. Become a friend to someone that’s struggling with this awful system. Thanks to Gordon and Roy for coming out today in the cold. Thank you SO MUCH. If anyone would like to donate there’s a donate button at the bottom of the blog, at the top and at the side thank you so much. I’m a skint single parent trying my best to help people and fight this horrific system. 30 week pregnant woman told to look for work and new Jobcentre debacles. Today was the first day of protesting outside the new Jobcentre. Access to this Jobcentre is either up the stairs pictured below or in a small lift in the library pictured below. Basically you’re stuffed if you’re claustrophobic and unable to climb stairs as well. Will the DWP be understanding of this… Time will tell. We arrived as normal at 10am outside the new Jobcentre. It was pouring down with rain which didn’t help things either. The minute that we arrived the police arrived, they must have been waiting for us. At first they were quite happy for us to stand outside the Jobcentre in the plaza area because it had been deemed a public place, however a member of the local authority decided differently. We were told that we had to stand in the area near the steps downstairs. Flaming ridiculous. Of course that the Jobcentre don’t want us there so they’ve probably had words with someone, you know how these things go. Despite this’ll we will be back outside the Jobcentre next week. We help people, hand food parcels out and support people… All things that the DWP should do. Whilst we were there local councillors who were standing with us weren’t impressed with us being moved. Believe me we will be back. Today was hectic because the weather was awful and we’re trying to get used to our new spot. There’s no signage up for the Jobcentre or the library either, its a fancy glass building and I like the library but there does need to be signs outside also. Another matter of concern that was brought to me by a member of the public was that there’s no privacy near the computers and DWP staff were milling round the library and looking at what people were doing. Lovely. A library is supposed to be a place of sanctuary. We directed lots of people to the Jobcentre because they didn’t know where it was because of the lack of signage and we still spoke to people and handed food parcels out to those needing one. I spoke to a heavily pregnant woman whos 30 weeks pregnant. Shes just made a claim for universal credit and has been told that she has to make a new cv and look for work. What planet exactly do these DWP advisors live on? No one will employ a woman thats pregnant even more so heavily pregnant. The DWPs attitude towards pregnant women makes me feel sick. Throughout the demo I was concerned and still are concerned about access to the Jobcentre for disabled people that can’t use lifts or stairs. What’s going to happen to them if they can’t attend their appointment? This needs addressing ASAP. Because the weather was awful, the rain didn’t stop and we were freezing cold we left a bit early. I’m so sorry but we were freezing and wet through. We handed out all of our food parcels and helped people. Next week we will help even more. Massive thanks to everyone that turned up to help in this dreadful weather. I really do appreciate it thank you so much. Thanks to everyone who reads wnd shares my blog, thank you so much ❤️. Also thanks to everyone that supports my blog and the campaign. Thank you so much. I’m a skint single parent just trying my best to help people and to raise awareness of the suffering of others. Universal Credit guarantees poverty, hunger, debt, homelessness and despair. Dear readers, its Thursday again and for a change it’s a lovely warm and sunny day. This gives many of us a huge sense of relief because we won’t have to put any heating on. Today was a busy but quiet day. I know that this doesn’t make any sense to you, but its a bit difficult to explain. When I arrived at the Jobcentre there was already a queue for the food parcels, amd Gordon had already arrived and was unloading the car. Everyone that I spoke to today was hungry, fed up and wanted things to change. No one wants to live like this. It’s exiating not living, and it’s cruel and demanding. I wish that I had a magic wand to change this system and devise a replacement that’s fair for everyone. I’ll list the conversations that I had this morning. Real names etc won’t be divulged either. I spotted Chris as he was walking away from the Jobcentre, clutching a piece of paper in his hands. The same piece of paper that’s handed out to everyone that makes an enquiry. Chris is a young man, very thin and pale. He was wearing thin clothing and looked downtrodden. I asked Chris if I could help him. To break the Ice I handed him one of our leaflets, he looked at me and said ‘It’s not f#####g fair you know.’ I asked him what had happened. Chris told me that had an appointment early this morning but he was unwell and couldn’t leave his home until he felt better. Chris had no money except the money that I gave him to buy a bit of food and a brew. He didn’t have any phone credit so he had walked to the Jobcentre to speak to someone. Chris was told that he couldn’t have another appointment and that he had to wait for two weeks for his next Jobcentre appointment. Chris was visibly upset, he knows that the reality of him being sanctioned are high and he didn’t know what to do. I gave him some advice and told him that I’m there for him if he needs any help at all and he left a little happier than he was earlier. Sanctions need to be abolished because they do kill people. I spoke to a young woman who was making her first claim. We advised her, gave her copies of our survival guide and leaflet. She appeared to be more confident when she walked away. It was then that we were heckled at from a car that was passing by. Not one of us could decipher what they said, but they drove off feeling rather happy with themselves. I then spoke to a young man how’s being made redundant after working at the same company for seven years. He’s never claimed any type of benefit before so I advised him, handed him our leaflets and had a nice chat with him. June is an older lady trying her best to navigate the awful universal credit system. June doesn’t know how to use a computer. Her son tries his best to help her fill in her job searches etc every week..
To make things worse June also has another problem with the universal credit system. Every month since she started to claim. Universal credit the computer system blocks her payment. Every month June has to telephone the DWP waiting over a hour and a half to speak to the right person. The reason for this is that the system says that June had previously claimed incapacity benefit. June doesn’t even know what that is nevermind claimed it. So every month she has to fight to get her rightful payments. No one should have to go through this. June suffers from various ailments and helps to look after her disabled daughter. June feels like totally giving up. Luckily we were there to provide some support and advice. Meet John. John has had his wallet stolen. John is also very thin, looks unwell and was wearing unsuitable clothes. John has no money. Thinking that the DWP would show some comlassion for his situation, he went to the Jobcentre for some advice. He was told that they wouldn’t help him, basically they didn’t care. My heart went out to him. In the good old days people in his situation were able to get a crisis loan to see them through to their next payment day. This used to work well, and I’ve had a few crisis loans in the past. We helped and advised John, I wish that we could do more but we can’t. I spoke to another man who has also been made redundant. We advised him about what to do etc. Meet Jenny, a young woman who works as a teaching assistant.. Jenny has children but has been forced to claim universal credit due to a relationship breakdown. Needless to say, Jenny is struggling. She’s got a mortgage to pay, children to feed and to say that she’s unhappy with the system is an understatement. Basically Jenny is being punished by the cruel universal credit system even though she’s working. Only a cruel Tory could devise such a cruel and heartless system. I spoke to another woman thats struggling with the universal credit system. Please remember that not everyone can use a computer. Many find it hard. I advised a woman who’s caring for her disabled daughter. I spoke to another woman struggling on universal credit even though she works. She’s also finding it hard to pay her mortgage payments. I spoke to a young man who’s making his first application for universal credit. I spoke to another man who’d just been made redundant. We also spoke to a couple who are experienced in fighting the system. They’ve self taught themselves and know their stuff. Well done to them. Having confidence or the appearance of confidence really does help. Advisors don’t see them as easy targets and are less likely to target them. Yet again we helped lots of people, provided food, advice and comparison to people. We’ll be returning next week to do the same. Many thanks to everyone that came to the demo today. Massive thanks to everyone that reads and shares my blog. Also massive thanks to everyone who supports my blog.